Purely by coincidence, and to my very great shock and deep sorrow, I only just discovered a few moments ago that Dr. Roi Kwabena, whose articles and news we had reproduced on The CAC Review, a man who had regularly corresponded with me over several years, suddenly died on 09 January, 2008, a day after being diagnosed with lung cancer. I still have email from him in my inbox that I have been promising to reply to! His websites are all still online, and I will make sure to privately archive them should they ever vanish. I cannot stress how sad this leaves me, and it’s not the first time that close correspondents have suddenly departed. When my turn comes, as it surely will, I am happy to know that I will be joining excellent company. For now, let me simply reproduce two obituaries that have appeared online, followed by links to his still living websites. Roi was a huge fan of the CAC and of the Carib Community–a Trinidadian, he too was proud of his Amerindian heritage as much as his African heritage, and blended the two together as dynamically as a Trinidadian would know how. I am sobbing and quite beside myself with grief here. Roi, I miss you! God grant you eternal rest and peace my brother, please save a chair for me! Dr. Roi Ankhkara Kwabena (July 23, 1956, Trinidad — January 9, 2008, England) was a cultural anthropologist, who has worked with all age ranges in Europe, Africa, Latin-America and the Caribbean for over 30 years. In commemoration of UN’s International Literacy Year 1990 he was “Writer In Residence” at the Trinidad’s Public Library. Roi was also appointed the sixth Poet Laureate for the Birmingham, England (2001-2002). He has hosted numerous readings by writers and actively promoted literature development for over 30 years internationally. His poetry has been commissioned for diverse purposes. He has lectured and performed at many schools, universities, cultural and social venues. In the mid-1990s he served as a Senator in the Parliament of Trinidad and Tobago. Roi’s affirmative advocacy has ensured his suitability for a variety of specialist projects addressing wide ranging issues such as functional and Cultural literacy, therapeutic harvesting of Memories by elders and young people (including cross generational dialogue) Anti-Racism, Community Cohesion, Social Inclusion, Cultural Diversity, redefining the Heritages of Indigenous peoples plus confidence building for convicted prisoners, excluded and traumatized students, Refugees, etc. Dr Kwabena is renowned for using critical analysis to examine the historical roots of racism and to assess the direct relevance this has on present society. In 2007, Roi Kwabena was included among activists, artists, campaigners, sport and media personalities on a wall celebrating efforts of The World’s Black Achievers :Past and Present at the Liverpool based International Slavery Museum. Kwabena died on January 9, 2008, one day after being diagnosed with lung cancer at a hospital in London. Prior to this, doctors had been treating him for pneumonia when it was discovered he had lung cancer. His funeral took place in London on January 26, 2008 and was cremated two days later. His ashes were flown to Trinidad. I MET him first in May 2007 at West Midlands’ Walsall Library. Dr Roi Kwabena was talking about his book ‘Dialogue’ and giving a lecture on how the African traditional religion travelled with the slavery ship to the Caribbean. When he mentioned the link between the Jamaican word ‘obeah’ and the Yoruba word ‘obi’ I was struck with surprise. He explained in details the throwing of kolanuts (obi in Yoruba language) pieces and prayers to the gods and goddesses. He mentioned the names of some Yoruba gods and goddesses; a proof of his vast knowledge of mother Africa. On Thursday, January 10th 2008, I opened my email box to find the shock news that Dr. Roi Kwabena died a day before (on Wednesday the 9th of January). The mail was sent to me by griotologist and dub-poet Kokumo who actually introduced me to the excellent works of Dr Roi Kwabena. Roi had a tremendous and positive impact both on individuals and on organisations lucky enough to encounter him. He offered endless encouragement and inspiration to try things, to do things and to believe in the value of doing those things. Everywhere you go you meet people who acknowledge that they would not have started writing or performing without a nudge from Roi. Many more were touched by his poetry, his drumming, his compassion and his humility. Dr Roi Kwabena was named Birmingham’s sixth Poet Laureate in 2001/2002. Born in 1956 in Trinidad, Roi Ankhkara Kwabena came to Britain in 1985 after political and cultural activities in his home country. 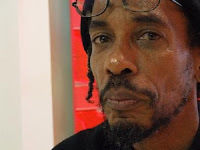 As a poet, musician, storyteller, historian and publisher, Roi describes himself as a “cultural activist”. He has performed with Hugh Masekela, Linton Kwesi Johnson, and Opai Adisa Palmer among others. He has lectured, performed and conducted workshops in the Caribbean, Europe and Africa in universities, schools, libraries and other venues. His published work includes collections of poems and spoken word and music CDs in a distinctive style of dialogue, drama and rhythm. He performed his poem about Birmingham for National Poetry Day in the Library Theatre and, on his appointment as Poet Laureate, was presented with a symbolic hammer and palette by the Lord Mayor of Birmingham. He wrote a poem to commemorate National Holocaust Day 2002 and another to coincide with Birmingham’s bid to be Capital of Culture in 2008. Dr Roi Kwabena has hosted numerous readings by writers and actively promoted literature development for over 30 years internationally. His poetry has been commissioned for diverse purposes. He has lectured and performed at many schools, universities, cultural and social venues. In the mid-1990s he served as a Senator in the Parliament of Trinidad and Tobago. Roi’s affirmative advocacy has ensured his suitability for a variety of specialist projects addressing wide ranging issues such as functional and Cultural literacy, therapeutic harvesting of Memories by elders and young people (including cross generational dialogue) Anti-Racism, Community Cohesion, Social Inclusion, Cultural Diversity, redefining the Heritages of Indigenous peoples plus confidence building for convicted prisoners, excluded and traumatized students, Refugees and more. Dr Kwabena is renowned for using critical analysis to examine the historical roots of racism and to assess the direct relevance this has on present society. In 2007, Roi Kwabena was included among activists, artists, campaigners, sport and media personalities on a wall celebrating efforts of The World’s Black Achievers; Past and Present at the Liverpool based International Slavery Museum. 􀁺TA MERI KA EL (Anthropology), 2006.